I do not sell products or services via my blog. If you have any further questions or concerns about privacy issues in relation to your personal data on my blog, please contact me directly. I have posted two stories about the Reddans from Gortnaglogh, Parish of Kilseily, and the Liddy family of Ballydonaghan at Kilnoe Parish on my main blog, simply because of DNA connections. However, their story is also relevant to the East Clare Emigrants since each had family members who emigrated. I’d be very interested in hearing from any descendants of these families, either in Ireland or in the USA or elsewhere. I’m also curious how many east Clare descendants have had their DNA tested…feel free to contact me if you wish. In my talk at the Conference mentioned previously, I provided some statistics and followed up with a short series of stories. As time was short some of these didn’t get quite the coverage I’d planned, so I’ll include them in full here. I’m also able to include some of the images I’d found which couldn’t be included in the presentation. First up, a member of Australian royalty which is what we call our convicts. James Boland was convicted of the attack on a house, or Whiteboyism, at the Galway courts on 28 March 1832 and was sentenced to life. The National Archives of Ireland hold a petition from James’ father Francis which includes a letter from John Lopdell Co Galway stating that James and his brother Michael had been tenants on his estate since 1 May 1831 (NAI Convict transportation database). There were also character references from inhabitants of Feakle parish, Co Clare, where the convict was born and where his parents were residing. James was held at Cork on a prison hulk before being transported on the ship Roslin Castle (450 tons) under the guard of the 21st Regiment of the Royal Scottish Fusiliers. James and 194 other prisoners sailed from Cork on 8 October 1832, arriving in Sydney on 5 February 1833 after 120 days at sea. James was allocated to Mr TWM Winder of Windermere, near Maitland in the Hunter Valley, where he was employed as an agricultural labourer. It would be many years before James’s name would cease to linked with that of the Roslin Castle as this was how they identified one convict from another. His son’s obituary suggests he worked as a shepherd for Wentworth but this would have to be verified by detailed research. Shepherding was a challenge in those early days setting the shepherd against the depredations of dingoes (wild dogs), wild blacks and wild whites. [i] It could be a very lonely life. As a convict James had to apply for permission to marry and in 1844, aged 33, he married Bridget Savage in Maitland. Bridget was a 29-year old free settler. James was already living at Luskintyre where he would remain for the rest of his life. James’s life sentence was essentially commuted by gaining first a Ticket of Leave on 11 May 1842, enabling him to move freely around the Maitland area. In 1849 James gained a conditional pardon meaning he was now a free man, though he could not return to the British Isles. This would have been a great moment for him. He was about 37 and had been a convict for nearly 16 years – not quite life, but not an easy path for a man who was barely an adult when convicted. James Boland died in a riding accident on 16 October 1876. 560 acres of 1st class grazing and agricultural land of which 40 acres are under cultivation and a large area ring-barked. Improvements including three houses, stockyards etc together with good will of the lease for a term of years of 7700 acres of 1st class grazing land which is permanently watered and well grassed. Quite an achievement for this Clare convict. Last month I presented at the Clare Roots Society’s Conference in Ennis, County Clare. It was a great pleasure and privilege to be able to share some findings from my research with the people attending…and just as great a pleasure to have three Irish cousins attending to listen. In the days preceding the conference I also had the opportunity to be interviewed on Clare FM Radio…my first ever radio experience. It was rather fun and not too scary! You can listen to the interview here. These stained glass windows in St Peter’s Catholic Church, Surry Hills, Sydney commemorate the Garvey and Hogan parents’ lives. This East Clare Emigrants blog is an extension of my earlier research into identified East Clare people which you can read out on my About the Projct tab above. I used both the Immigration Deposit Journals from New South Wales and the Board’s Immigrant Lists to identify the east Clare immigrants to eastern Australia and came up with some 1200 names of passengers who came under an assisted passage, one paid in large part by a colonial government. The problem then became how to identify these same immigrants as their lives progressed in Australia – how to distinguish between those many McNamaras and O’Briens? This is where Trove, and its digitised newspapers, became important as a tool to rediscover those East Clare immigrants and their life stories. It also became apparent how many others came who I had not yet identified, opening up further vistas for research. And, once again, many thanks to those members of the Clare Genealogy Group on Facebook who responded to my request for images of their Clare ancestors to include in collages for my talk. State Records of New South Wales Board Immigration Lists, NSW Archives Kit. Microfilms 2136-37; 2460-2483. (Contain more information than the Agent’s Lists which have been digitised). Baines, D European Migration, 1815-1930: Looking at the emigration decision again. The Economic History Review. New Series, Vol 47, No 3 (Aug 1994). Burke, B. An East Clare priest: Fr John Burke 1805-1881 in Sliabh Aughty 2005. Clement, C Migration to New Zealand: A Guide for Family History Researchers. Unlock the past publications 2016. Farmer, K Arrivals in Australia from 1788. Unlock the past publications 2015. Fitzpatrick, D Oceans of Consolation. Melbourne University Press, Melbourne 1995. Haines, R, Life and Death in the Age of Sail: the passage to Australia. UNSW Press, Sydney, 2003. Haines, R Emigration and the Labouring Poor: Australian Recruitment in Britain and Ireland 1831-1860. St Martins Press, Basingstoke, 1997. Kennedy L, et al (eds) Mapping the Great Irish Famine. Four Courts Press, Dublin, 1999. Kleinig, M & Richards, E (eds) On the wing: Mobility before and after emigration to Australia. Visible Immigrants 7, Anchor Books, Sydney 2013. O’Brien, P Broadford. County Clare 1830-1850: A study of a rural community. Unpublished MA (History and Local Studies), University of Limerick, 1999. O’Mahoney, C. Emigration from the Limerick Workhouse 1848-1860 in The Old Limerick Journal, Spring 1982. Richards, E (ed) Visible Women: Female immigrants in colonial Australia. Division of Historical Studies and Centre for Immigration and Multicultural studies, ANU, Canberra, 1995. Richards, E (ed) Poor Australian immigrants in the nineteenth century. Visible Immigrants Series 2. Division of Historical Studies and Centre for Immigration and Multicultural studies, ANU, Canberra, 1991. Reid, R Farewell My Children: Irish Assisted Emigration to Australia 1848-1870, Anchor Books, Sydney 2011. Reid, R Aspects of Irish assisted emigration to New South Wales, 1848-1870. Unpublished PhD thesis, Australian National University, Canberra, 1992. Rushen, E Colonial Duchesses: the migration of Irish women to New South Wales before the Great Famine. Anchor Books, Sydney 2014. Rushen, E & McIntyre, P Fair Game: Australia’s first immigrant women. Anchor Books, Sydney, 2014. Try searching for various combinations including “county Clare” + Obituaries (or death or place). It includes many references to family overseas especially in obituaries (where they exist). Not all cemeteries but a good range. Otherwise find the name of the local council for the place and search for cemetery and burials/graves. Available as ebooks also through the same site. With thanks to all those who’ve assisted me including my family history friends who sent their emigrants’ photos for the collages, and to Eric Shaw for the news story on the Clare Castle emigrants. (At the end of the talk there will be a slide listing names and ancestors for the photographs used in the collage). Each Australian state has responsibility for its own official BDM records. Each colony in the pre-Commonwealth era had its own migration scheme. As always some records are only available offline including specific migration documents. You can find each State Archive by google searching for the state + archive. Each archive will have different records available. Most have a guide or similar information for family history researchers. There are also church archives, occupational archives etc. Google is your friend. You can read more about the Clare Roots Society here or follow them on Facebook here. Today’s post is a recyled version of one I wrote four years ago on my Family History Across the Seas blog.I’m also participating in the National Family History Month challenge initiated by my genimate Alex from Family Tree Frog blog. I’m in Irish mode at the moment, and as most of us know “none” of the census records survived from the 19th century. No, they weren’t all burnt in the Troubles, some were actually destroyed as part of a bureaucratic process. So Irish family researchers need to be a little more innovative and try other strategies. You may be lucky and find your ancestors in some of the very few surviving census records or those where someone applied for a pension and needed to verify their birth using a 19th century census extract. Unfortunately I don’t have the luck of the proverbial Irish and my 2x great-mother’s sister, Honora Garvey nee O’Brien, is not among these, even though she was quite poor.What a blessing that would have been! The next step is to turn to the Griffith’s Valuations which are now available online through Ask About Ireland. It’s quite wondrous now that we can get instant answers and have a digital map to go with it. Sure beats having to look at the GV on microfiche and visiting Ireland for the map. I could make my life easier, and this post very brief, by exhorting you to beg, borrow or buy a copy of James Reilly’s book Richard Griffith and his Valuations of Ireland. If you have Irish ancestry, do yourself a favour and check its availability at your favourite bookstore or library. Hint: an preview of this book is now available to read through Google Books – enough for you to see how much value this seemingly slight book contains. In the meantime have a read of this short article by Reilly called Is there more in Griffith’s Valuations than just names? Reilly’s book will astonish you with just how much lies behind those tables of information that we Irish researchers treat as a substitute for the census. I think the temptation for us is to simply look at the superficial facts of the size of our ancestor’s land, its value and who the immediate lessor was. Reilly makes it clear just how much more there is to even the summary information and in particular the significance of the number and alpha reference at the start of the line. The new online access makes it easy to link the search with the map reference indicated by that originating number, but again, do we go beyond that? How about the field books, perambulation books and house books that lie behind the valuation? Yes, they don’t exist for all parishes but wouldn’t you want to check? Unfortunately they’re mostly only available in Ireland but if you’re sufficiently keen you may choose to employ a researcher to follow it up, especially if you can determine they exist. Have you noticed on the GV maps at Ask About Ireland, there’s an option to include the house books? If you activate that option you’ll be able to see where they exist for which townland. Murphy at work again, “my” townlands don’t have surviving house books. The complication throughout is to know which one is really is your man (or woman)! From my point of view you need some other way, eg parish registers, to be assured of which one you need to be following. And of course with the great advance of digitisation, the Catholic parish registers are available through the National Library of Ireland or Ancestry or Findmypast. The Irish Valuation Office now has current valuation information available to search online (try typing in your county and townland). In many ways this isn’t of great use but it satisfies a little curiosity. You can click on any of the blocks and you will be given the owner’s name and other details – perhaps a way to find a relative or at least someone to ask. I was surprised just how familiar were the names of people still holding land in Ballykelly – echoes of the 1911 census and also Griffith’s. Also surprised to find one Not really of great specific use but interesting none the less! How does that work? Well, the original valuations were reassessed on a regular basis for change of tenancy or ownership, improvements or deterioration of the property. On the original books held by the Valuation Office, these amendments are messy but able to be followed because they are in different coloured inks and different hands. Your 2 x great grandfather’s death might result in a new entry with his wife’s name, then subsequently various children until it perhaps passes to a distant relative or out of the family. The good news is that these are available wherever you live because you can order them through the Family Search catalogue and have them delivered to your local family history centre or approved library. The easiest ways to find the correct film is to search the catalogue by keyword (not anything else). For example if I enter “valuation revision Ballykelly Clare” I promptly obtain film number 819471. I strongly encourage you to order in the relevant film for your parish. While it’s in black and white, not colour as it is at the Valuation Office, it generally runs across the page on the same “line”. Not perfect but better than nothing if you’re not heading to Dublin. This is the result of my search on Family Search for Ballykelly, using the keyword option. The other benefit is that it lets you search beyond the timeframe of the initial valuations to perhaps find your ancestor. For example, I wanted to see where my James Sherry and his family were living in the townland of Knockina outside Gorey, Wexford in the 1870s before they emigrated (I had Knockina from the Gorey parish registers). The valuation revisions suggested to me that they must have been living in a property owned by the Southern and Eastern Railway as that was the only property not attached to a specific family and I knew he was a railway worker. If my deduction is correct, it suggests he may have held a position of some responsibility, although it’s likely he was still a grassroots worker. When the temporary parish priest took us (in 1995) to meet someone who he said would know about my O’Briens from Ballykelly, I was rather mystified as the surname was different (though essentially the same as my 2xgreat grandmother’s brother’s wife’s). It was through Paddy that I saw my ancestor’s plot of land and the remains of their house. Afterwards, in Dublin, we visited the Valuation Office and saw the folders piled high on the shelves. We wondered why and how the land had been transferred. By following the GV revisions, I had a lightbulb moment as Paddy had inherited the land after the death of all my great/grand aunts who were single. While I’ve also been able to read the Ballykelly field books at the National Archives of Ireland, I confess they were bewildering to this urbanite. Still it’s all grist to the genealogical mill. I really can’t emphasise enough the value of following your family from the original valuations through the revision lists to see what happened to them and their property. Irish research may be challenging but it isn’t impossible. You do, however, need to mine every possible source in the country to which they emigrated, in order to pin down their home parish eg Australian parish registers, certificates, obituaries (a clue not fact), gravestones, oral histories, siblings’ certificates etc. You really DO need their parish of origin, the townland or the estate from which they came. While Agent’s Immigrant Lists (online) are helpful, what you really need to look at are the Bounty Immigrant Lists (on microfilm from State Records NSW) which include parents’ names and place of origin (what you want is the 2nd reel number in the list, where it’s available eg Reel2481 not 2139). Also check the Immigration Deposit Journals on microfilm or through Ancestry. Good luck and happy “hunting”. As I mentioned earlier, I’ve been trawling Trove looking for “Missing friends” + “County Clare”. There’s certainly been some interesting stories among them, that’s for sure: long silences, unknown deaths and as time passes, the search for family and descendants in estate proceedings. Among them are examples of searches from the USA, Canada and Britain. One story that caught my eye was in The Advocate lauding their own success at finding lost relatives. “THE ADVOCATE” AS A FINDER. About 12 months ago we pointed out, how this journal, through its advertising columns, traced the relatives of two families who had been separated for years—in one case over 60 years. We now call attention to two more cases of relatives being brought into communication with each other through the medium of “The Advocate.” … Last month, Dr. T. P. M’lnerney sent the following inquiry, which appeared in “The Advocate” :— M’INERNEY.—Wanted, information of Matthew and Michael M’lnerney, and their sister, Honora Vaughan, who came to Australia about 1850 (my emphasis). Their brother, Dennis M’Inerney, who was born at O’Callaghan Mills, County Clare, Ireland, went to America about the same year. A relative in America wants the information. P. M’INERNEY. Aug. 12. 1911. I couldn’t recall seeing the people mentioned in this story, so I searched my indexes. Nope, not there. Back to Trove and searching for various combinations came up with no result, until I changed it to America and Missing Friends. This is what came up in the text from the OCR (optical character recognistion). No wonder it hadn’t turned up in my primary search or it my subsequent searches (McInerney, County Clare, Matthew McInerney, O’Callaghan’s Mills). It wasn’t as if the scanning was all that unclear so who knows what went wrong. The text has now been corrected so future searchers should find it quite easily, but it’s a lesson on how we can over-rely on the OCR and assume something wasn’t reported in the paper. What is truly remarkable about the story, though, is how quickly the problem had been solved. The original advertisement was published on 29 July and just three weeks later the newspaper had news that contact had been made with family members who’d been separated for 6o years. Isn’t that remarkable in the pre-digital era…or in any era, really. And a bonus: I’ve acquired more East Clare emigrants. Wouldn’t you love to know the stories that flowed between the branches of the family on two continents? I wonder if any of my readers are descendants of Michael, Matthew, Honora or Dennis? I’m currently beavering away on Trove looking for all Missing Friends notices which mention County Clare. These advertisements are revealing in a host of unexpected ways. Some are frustratingly ambiguous (left Ireland) but others can be very specific, listing a ship or a townland. As the decades roll towards the end of the 19th century they become quite tragic when you see advertising for parents; mothers trying to trace children; or cousins seeking kin. While a few may have emigrated only recently it’s especially moving to read of ones which indicate the person left decades before yet no one knows where they are. Had they died? Did they have no one to write? Were they ashamed because life hadn’t turned out how they expected? Did they simply forget the families they left in Ireland as a way of preserving themselves from the heartache of separation? Had they re-emigrated to another country as we see in some of these examples?. What a treasure we have in Trove which enables us to pursue a research interest which would otherwise be nigh impossible. It helps us to burrow down into the movement and lives of many people and draw the information together. The previous posts tell the story of Edmund Cahill’s sister, Bridget Reeves, and his mother Julia Cahill as well as some of his own migration story. When Edmund arrived in Victoria he stated his occupation as “shoemaker”. I found an 1874 article in the Gippsland Times which suggests he maintained that occupation for quite some time. Although Edmund settled initially in Stratford where sister Bridget and her husband were living, he later moved to Briagolong, a town 15kms north of Stratford. 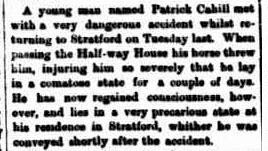 This story of Edmund’s brother, Patrick’s, accident offers clues to why Patrick may have died young in July 1872, aged 38 years. Although it is not conclusive that this is the same chap it seems highly likely pending confirmation. 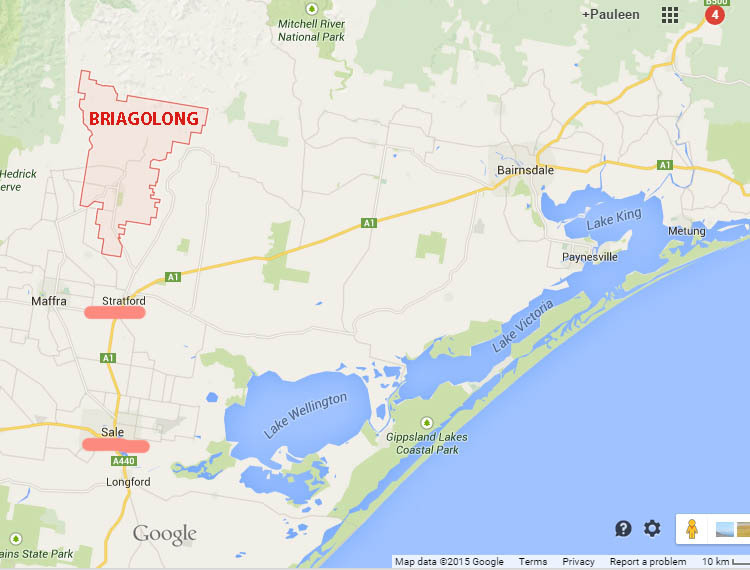 Map of the Gippsland area of eastern Victoria, showing Briagolong, Stratford and Sale. Edmund Cahill died on 24 June 1921 and was buried in Briagolong Cemetery his gravestone can be seen on the Billion Graves website here.The newspaper obituaries serve as a testament to Edmund’s life as an early pioneer in Gippsland. Edmund Cahill had plainly played a significant role in the establishment of the Catholic church in Stratford, Gippsland, donating land for its establishment…it could probably be claimed he was “a pillar of the church”. Bridget married John Samuel Reeves two years after arrival. She and her husband moved interstate – again demonstrating how immigrants would move around to find a location and work opportunities which suited them. Money was sent to Bridget’s family in the form of remittances to fund their migration in turn. A two-generational chain-migration ensued with a middle-aged mother, adult sons and daughters followed. This family did stay in close proximity to each other over time. The discovery of Bridget Reeves’ gravestone and the notice of her mother’s (Julia Cahill) death notice, pulled the unravelling thread to a genealogical discovery. You can read this story here. I decided to explore when Bridget’s family arrived in Victoria. 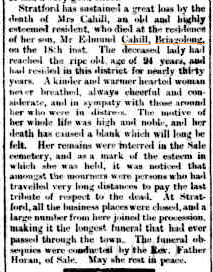 Her brother Edmund’s obituary revealed he’d lived in the Gippsland area for some years and had an estimated year of arrival in the late 1850s. Turning to the PROV immigration indexes online I searched both assisted and unassisted immigrants. My thought was that given his mother’s age, she may have been unassisted. However I could find no Julia Cahill anywhere near her age in either set of indexes, and NSW provided similar results. I knew it wasn’t unusual for emigrants to fudge their ages so they could gain access to the government’s passage assistance. In this the east Clare emigrants of this time frame were often given a helping hand by the parish priest of Broadford, Fr John Bourke. Temporarily giving up on Julia, my search focused on Edmund Cahill and there were two possibilities: one, Edmand (sic), aged 20 on the Mindoro in October 1857 and another, Edmond aged 17 on the Lady Milton in July 1857. 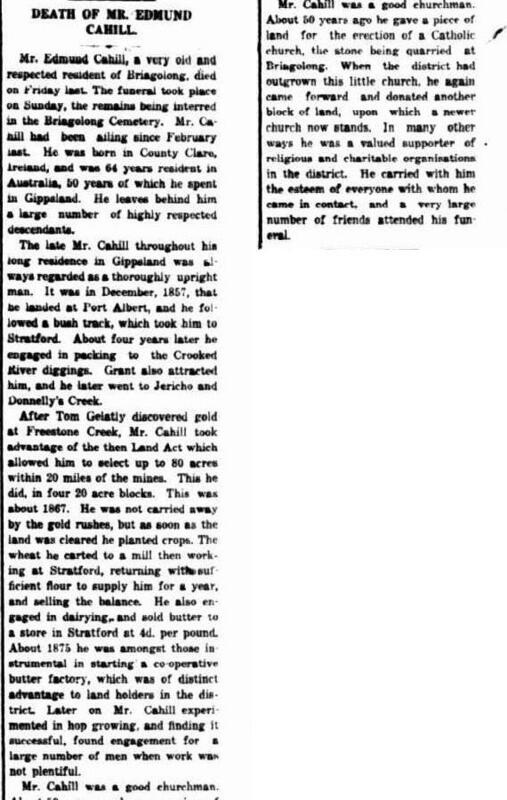 I eliminated the second because of the cluster of people he was travelling with, and his place of birth (Tipperary). Next step was to search for all Cahills on the Mindoro as that fitted this Edmund’s age best. Bingo! There was Edmund (20), Catherine (17) and Pat (22). But were they the right family? Catherine proved not to be part of this group because she came from Kilkenny not Clare. I used Ancestry to search for the digitised documents[i] given it was late at night and a trip to the library wasn’t possible. 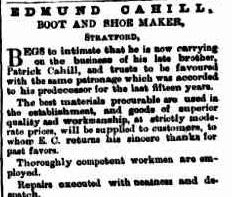 Edmand Cahill, 20, a shoemaker from Clare was listed among the single men as was Pat Cahil (sic), 22 also a shoemaker from Clare and both could read and write. They had signed out of the ship on their own account on 19 November…later than others so I wonder why the delay. Original data: Victoria. Inward Overseas Passenger Lists (British Ports). Microfiche VPRS 7666, copy of VRPS 947. Public Record Office Victoria, North Melbourne, Victoria. CLICK on the image to see it enlarged. Bearing in mind the different spelling of Pat’s surname I again searched the indexes for Cahil. Another Eureka moment as it turned up additional passengers: Judith (44), Margaret (18) and Anne (14). Against their names on the Certificate of Final Departure[ii] was an “R” indicating their fare had been paid by family or friends as remittances. Had Julia originally been Judith? That was my question. The Immigration documents clarified it once and for all: they were going to Mr J S Reeves, son-in-law, Stratford, Gippsland. Mystery solved. I wasn’t concerned about Julia’s 23 year drop in age given what I knew from other experiences…but she must have worn well to get away with it! Now we had clear links between Bridget Reeves, her brothers Edmund and Pat, sisters Margaret and Anne and mother Julia…and while there are many mentions they came from Clare, it was only Bridget’s legal separation that referred to her specific place of origin in Kilbane. I think Julia/Judith was so brave to make the move from Ireland to Australia when she was 67. As she’s listed as a single woman on the ship’s documents it implies her husband, John Cahill, had died before the family emigrated. Unfortunately I can find no reference to them in the Griffiths’ Valuations in Killokennedy from 1852 though there is a Johanna Cahill in Kilbane village…surely it’s too much to think she had three first-name incarnations. As I mentioned previously, I found only indirect potential mentions in the parish registers which indicate a potential link to the Vaughan family. Julia was able to spend 28 years with her family in Gippsland before her death, which was well recognised in the newspapers. In death as in life, she is surrounded by her family and remembered on the gravestone in the Sale cemetery. Rest in Peace, Julia Cahill, another foundation member of our Colonial women who helped build our country. As an aside, the man who was lost overboard on the Mindoro was William Bland and his death is recorded on the ship’s registers as 1 October not 1 August. His wife, Elizabeth Bland, only 23, from Middlesex, was left with two small children when she went to friends at Prahran. [i] Ancestry.com. Victoria, Australia, Assisted and Unassisted Passenger Lists, 1839–1923 [database on-line]. Provo, UT, USA: Ancestry.com Operations Inc., 2009. Original data: Victoria. Inward Overseas Passenger Lists (British Ports). Microfiche VPRS 7666, copy of VRPS 947. Public Record Office Victoria, North Melbourne, Victoria.Victoria. Inward Overseas Passenger Lists (Foreign Ports). Microfiche VPRS 7667, copy of VRPS 947. [ii] Ancestry.com. Victoria, Australia, Assisted and Unassisted Passenger Lists, 1839–1923 [database on-line]. Provo, UT, USA: Ancestry.com Operations Inc., 2009. Thank you for visiting my blog. I love it when people leave comments and respond to every one. Please do get in touch if you have ancestors from East Clare.